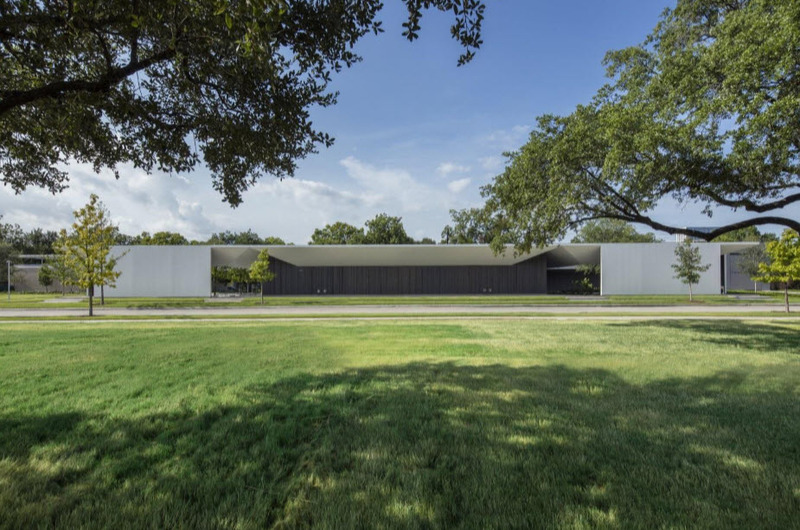 The Menil Drawing Institute, a 2,787-m2 (30,000-sf), $40 million freestanding museum building in Houston, Texas, has an external roof canopy to protect light-sensitive art from the sunshine. The Menil Drawing Institute, a 2787-m2 (30,000-sf), $40-million freestanding museum building in Houston, Texas, opened earlier this month. The institute is the first freestanding museum facility built expressly for the acquisition, study, exhibition, conservation, and storage of modern and contemporary drawings. Designed by Johnston Marklee in collaboration with landscape architects Michael Van Valkenburgh Associates, the building is constructed on a footprint of 1579 m2 (17,000 sf) and rising to a height of 5 m (16 ft). It is midway in size between the domestic architecture of the bungalows ringing the Menil campus and the institutional architecture of the main museum building. The design by Johnston Marklee shields light-sensitive works on paper from harmful natural light, yet allows the common areas of the building to benefit from carefully modulated sunshine. A square, open-roofed, landscaped courtyard on the west serves as the building’s entrance. There are two other courtyards of identical size: an interior space adjacent to the curatorial offices and a second exterior courtyard on the east. A living room, functioning as both a circulation spine and a gathering place links the east and west courtyards. The 278 m2 (3,000 sf) of galleries are located on the south side of the building, while the north side consists of administrative offices, study rooms, and the conservation lab. As visitors approach the building, the sharp Texas sunlight is reduced by the external roof canopy. By the time they walk through the entrance, the intensity of the light is once again diminished, even as the courtyards enable a view of the outdoors and allow a modest level of baffled light to spill into the building. “This quietly innovative architecture of the Menil Drawing Institute allows us to make drawing, the most personal of all artistic practices, accessible as never before, to artists, to scholars, to students, and to the public. The Menil Drawing Institute will engage with our community, with the entire world of arts, in an exciting new way—and we are immensely proud to welcome everyone to visit, explore, and enjoy,” said Rebecca Rabinow, director of the Menil Collection. In addition to designing the Menil Drawing Institute, Johnston Marklee also designed the nearby energy house to provide a new central source of heating and cooling for the campus. The Menil Drawing Institute is the centerpiece of the southern side of the Menil neighborhood. The park designed by Michael Van Valkenburgh Associates features hundreds of plants and trees, as well as a 9 x 9-m (30 x 30-ft) deck to serve as a platform for performances and video projections.